Interested in assessments for your school or district? Our program is successful for two reasons: content and people...Our staff utilizes the data from the formative assessments to help students 'learn to learn' with the online content. Edmentum Assessments identify learning gaps and help educators zero in on opportunities for improvement. Our standards-based, fixed-form and adaptive assessments help improve and promote growth by providing targeted instruction. Flexible and individualized instructional approaches are key to providing students with targeted interventions at the right level in a format that will resonate. Easily access and analyze data to take action and identify grade-level skills in addition to progress from one assessment to the next. Fill critical gaps in prior knowledge and target off-grade-level content areas needing more emphasis for grades 3 through adult. Our high-quality, adaptive assessments help you identify both what students know and where learning breaks down throughout the school year, and they prescribe engaging digital curriculum so that students can successfully work independently at the appropriate skill level. Support learners in working toward mastering grade-level skills, and seamlessly track progress from one assessment to the next. Our fixed-form assessments provide an evaluation of your students’ progress or grade-level proficiency and prescribe rigorous digital curriculum to fill learning gaps and individualize instruction. We have used [Edmentum] Accucess to support reteaching, as well as allowing students to explore studies beyond grade level. Our valid and reliable adaptive and fixed-form assessments ensure that students receive instructional content that pinpoints precisely where additional intervention and curriculum support is required. Assessments are designed to measure a deeper, more critical understanding of curriculum standards. Our assessment questions promote higher-order thinking and inquiry with technology-enhanced items that provide broader coverage of depth of knowledge (DOK) levels. Our assessments integrate with our high-quality, rigorous curriculum, providing individualized learning paths for more targeted instruction. Instructional modules are automatically prescribed when students fail to demonstrate proficiency, and our high-quality curriculum will help remediate objectives in which students are struggling. Edmentum allows you to easily track your program through real-time data. You can use the insights gained from our assessments to evaluate students’ knowledge and skills before beginning an instructional unit or a semester to determine areas that need special emphasis and focus. Learn more about individualized, competency-based, and data-driven learning. 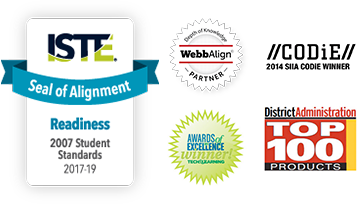 Discover how Edmentum can partner with you to improve student outcomes. Catch the latest blog posts to learn how individualized approaches are driving personalized learning.